Carbon Dioxide Can Act As A Greenhouse Gas. Carbon dioxide is made of one carbon and two oxygen atoms. Carbon dioxide is a chemical compound. Carbon dioxide is often referred to by its formula. The formula for Carbon dioxide is CO2. Carbon dioxide is present in the Earth's atmosphere at a low concentration and acts as a greenhouse gas. In its solid state, Carbon dioxide is called dry ice. Carbon dioxide is a major component of the carbon cycle. Structure & properties. n, er, etc. 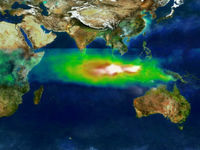 Atmospheric carbon dioxide derives from multiple natural sources including volcanic outgassing, the combustion of organic matter, and the respiration processes of living aerobic organisms; man-made sources of carbon dioxide come mainly from the burning of various fossil fuels for power generation and transport use. It is also produced by various microorganisms from fermentation and cellular respiration. plants convert carbon dioxide to oxygen during a process called photosynthesis, using both the carbon and the oxygen to construct carbohydrates. In addition, plants also release oxygen to the atmosphere, which is subsequently used for respiration by heterotrophic organisms, forming a cycle. Chemical and physical properties of Carbon dioxide. Carbon dioxide is a colorless gas which, when inhaled at high concentrations (a dangerous activity because of the associated asphyxiation risk), produces a sour taste in the mouth and a stinging sensation in the nose and throat. These effects result from the gas dissolving in the mucous membranes and saliva, forming a weak solution of carbonic acid. You may notice this sensation if you attempt to stifle a burp after drinking a carbonated beverage. Its density at 25 ºC is 1.98 kg m-3, about 1.65 times that of air. The carbon dioxide molecule (O=C=O) contains two double bonds and has a linear shape. It has no electrical Dipole. As it is fully oxidized, it is not very reactive and, in particular, not flammable. At temperatures below -78 ºC, carbon dioxide changes directly from a gas to a white solid called dry ice through a process called deposition. liquid carbon dioxide forms only at pressures above 5.1 atm; at atmospheric pressure, it passes directly between the solid phase and the gaseous phase in a process called sublimation. Carbon dioxide is Soluble in water, in which it spontaneously interconverts between CO2 and H2CO3 (carbonic acid). The relative concentrations of CO2, H2CO3, and the deprotonated forms HCO3- (bicarbonate) and CO32-(carbonate) depend on pH. In neutral or slightly alkaline water (pH > 6.5), the bicarbonate form predominates (>50%) becoming the most prevalent (>95%) at the pH of seawater, while in very alkaline water (pH > 10.4) the predominant (>50%) form is carbonate. The bicarbonate and carbonate forms are very soluble, such that air-equilibrated ocean water (mildly alkaline with typical pH = 8.2-8.5) contains about 120 mg of bicarbonate per liter. General uses for Carbon dioxide. Refrigerant use of carbon dioxide. Liquid carbon dioxide was used as a refrigerant prior to the discovery of R-12 and may be enjoying something of a renaissance due to environmental concerns. Its physical properties are not favorable, having a low critical temperature of 88ºF/31ºC (the maximum temperature at which it will condense from gas to liquid) and high critical pressure of 1070 PSI (the pressure required for phase change at the critical temperature). These properties necessitate the use of very strong refrigeration plumbing to contain the operating pressure of ~1400 psi, in contrast to pressures of ~300 psi for R-134a systems. Although carbon dioxide is non-inflammable and non-toxic it is an asphyxiant, which raises safety concerns in the case of leaks in enclosed spaces or system rupture in the case of vehicle accident. Despite these issues Coca-Cola has fielded CO2-based beverage coolers and the US Army and others have expressed interest. Dry ice is a genericized trademark for solid ("frozen") carbon dioxide. The term was coined in 1925 by Prest Air Devices, founded in Long Island City, New York in 1923. The name refers to the fact that under normal atmospheric pressure, solid CO2 sublimates, or changes directly into a gas without passing through a "wet" liquid phase. As a general rule, dry ice will sublimate at a rate of five to ten pounds every 24 hours in a typical ice chest. Dry ice is produced by compressing carbon dioxide gas to a liquid form, removing the heat produced by the compression (see Charles's law), and then letting the liquid carbon dioxide expand quickly. This expansion causes a drop in temperature so that some of the CO2 freezes into "snow", which is then compressed into pellets or blocks. The freezing point of CO2 is -109.3ºF or -78.5ºC. 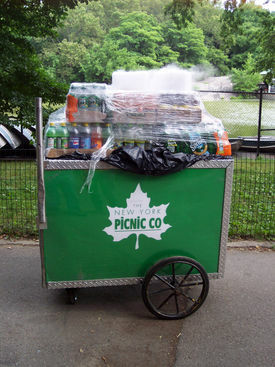 Dry ice used to cool drinks in Central Park. (New York City, New York, U.S.). Cooling foodstuffs, biological samples, and other perishable items, particularly for shipment. Producing "dry ice fog" for special effects. When dry ice is put into contact with water, the frozen carbon dioxide sublimates into a mixture of cold carbon dioxide gas and cold humid air. This causes condensation and the formation of fog; see fog machine. The use of warm water speeds up sublimation and leads to more vigorous production of fog. . Tiny pellets of dry ice (instead of sand) are shot at a surface to be cleaned. Dry ice is not as hard as sand, but it speeds processing by sublimating to a gas and does not produce nearly as much lung-damaging dust..
Increasing Precipitation from existing clouds or decreasing cloud thickness by cloud seeding. Producing carbon dioxide gas as needed in such systems as the fuel tank inerting system in the B-47 aircraft. .
Brass or other metallic bushings are buried in dry ice to shrink them so they will fit inside a machined hole. When the bushing warms back up, it expands and makes an extremely tight fit. As a cooling supplement for overclocking a Central processing unit, a graphics processing unit, or other types of computer hardware..
A rudimentary cloud chamber can be built using dry ice to supercool alcohol vapor..
Dry ice requires special precautions when handling. It is extremely cold, requiring proper insulating gloves to handle. It constantly produces carbon dioxide gas, so it cannot be stored in a light duty sealed container as the pressure buildup will quickly cause the container to explode (see dry ice bomb). The sublimated gas must be ventilated; otherwise, it may fill the enclosed space and create a suffocation hazard. Special care for ventilating vehicles is needed as well because of the small space. People who handle dry ice should also be aware that carbon dioxide is heavier than air and will sink to the floor. Some markets require those purchasing dry ice to be of 18 years of age or older. Solid amorphous of carbon dioxide. In June 2006, an Italian-French science team announced the synthetic production of solid amorphous CO2 glass. This form of glass, called carbonia, was produced by supercooling heated CO2 at extreme pressure (40-48 GPa or about 400,000 atmospheres) in a diamond anvil. This discovery confirmed the theory that carbon dioxide could exist in a glass state similar to other members of its elemental family, like silicon (silica glass) and germanium. Unlike silica and germanium oxide glasses, however, carbonia glass is not stable at normal pressures and reverts back to gas when pressure is released. Carbon dioxide is an end product in organisms that obtain energy from breaking down sugars or fats with Oxygen as part of their metabolism, in a process known as cellular respiration. This includes all plants, animals, many Fungi and some bacteria. In higher animals, the carbon dioxide travels in the blood from the body's tissues to the lungs where it is exhaled. In plants using photosynthesis, carbon dioxide is absorbed from the atmosphere. Carbon dioxide content in fresh air varies and is between 0.03% (300 ppm) to 0.06% (600 ppm), depending on location and in exhaled air approximately 4.5%. When inhaled in high concentrations (greater than 5% by volume), it is immediately dangerous to the life and health of plants, humans and other animals. The current threshold limit value (TLV) or maximum level that is considered safe for healthy adults for an 8-hour work day is 0.5% (5000 ppm). The maximum safe level for infants, children, the elderly and individuals with cardio-pulmonary health issues would be significantly less. Acute carbon dioxide toxicity is sometimes known as choke damp, an old mining industry term, and was the cause of death at Lake Nyos in Cameroon, where an upwelling of CO2-laden lake water in 1986 covered a wide area in a blanket of the gas, killing nearly 2000. The lowering of carbon dioxide in the atmosphere is largely due to absorption by plants, which convert it to sugars through photosynthesis. Phytoplankton photosynthesis absorbs dissolved CO2 in the upper ocean and thereby promotes the absorption of CO2 from the atmosphere (Falkowski P. Scholes RJ. Boyle E. Canadell J. Canfield D. Elser J. Gruber N. Hibbard K. Hogberg P. Linder S. Mackenzie FT. Moore B 3rd. Pedersen T. Rosenthal Y. Seitzinger S. Smetacek V. Steffen W. The global carbon cycle: a test of our knowledge of earth as a system. [Review] [65 refs] [Journal Article. Review] Science. 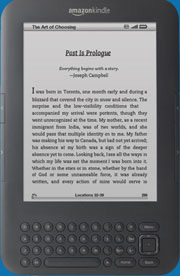 290(5490):291-6, 2000. Hemoglobin, the main oxygen-carrying molecule in red blood cells, can carry both oxygen and carbon dioxide, although in quite different ways. The decreased binding to oxygen in the blood due to increased carbon dioxide levels is known as the Haldane Effect, and is important in the transport of carbon dioxide from the tissues to the lungs. Conversely, a rise in the partial pressure of CO2 or a lower pH will cause offloading of oxygen from hemoglobin. This is known as the Bohr Effect. According to a study by the USDA, an average person's respiration generates approximately 450 liters (roughly 900 grams) of carbon dioxide per day. CO2 is carried in blood in three different ways. Most of it (about 80%-90%) is converted to bicarbonate ions HCO3- by the enzyme carbonic anhydrase in the red blood cells. 5%-10% is dissolved in the plasma and 5%-10% is bound to hemoglobin as carbamino compounds. The exact percentages vary depending whether it is arterial or venous blood. The CO2 bound to hemoglobin does not bind to the same site as oxygen; rather it combines with the N-terminal groups on the four globin chains. However, because of allosteric effects on the hemoglobin molecule, the binding of CO2 does decrease the amount of oxygen that is bound for a given partial pressure of oxygen. Carbon dioxide may be one of the mediators of local autoregulation of blood supply. If it is high, the capillaries expand to allow a greater blood flow to that tissue. It is interesting to note that although it is oxygen that the body requires for metabolism, it is not low oxygen levels that stimulate breathing, but is instead higher carbon dioxide levels. As a result, breathing low-pressure air or a gas mixture with no oxygen at all (e.g., pure nitrogen) leads to loss of consciousness without subjective breathing problems. This is especially perilous for high-altitude fighter pilots, and is also the reason why the instructions in commercial airplanes for case of loss of cabin pressure stress that one should apply the oxygen mask to oneself before helping others-otherwise one risks going unconscious without being aware of the imminent peril. Plants remove carbon dioxide from the atmosphere by photosynthesis, which uses light energy to produce organic plant materials by combining carbon dioxide and water. This releases free oxygen gas. Sometimes carbon dioxide gas is pumped into greenhouses to promote plant growth. Plants can potentially grow up to twice as fast in conditions where extra CO2 is available, although there is no additional benefit at concentrations beyond 1200 ppm. Plants also emit CO2 during respiration, but on balance they are net sinks of CO2. Carbon dioxide is a surrogate for indoor pollutants that may cause occupants to grow drowsy, get headaches, or function at lower activity levels. To eliminate most Indoor Air Quality complaints, total indoor carbon dioxide must be reduced to below 600 ppm. NIOSH considers that indoor air concentrations of carbon dioxide that exceed 1000 ppm are a marker suggesting inadequate ventilation (1,000 ppm equals 0.1%). ASHRAE recommends that CO2 levels not exceed 1000 ppm inside a space. OSHA limits carbon dioxide concentration in the workplace to 0.5% for prolonged periods. The U.S. National Institute for Occupational Safety and Health limits brief exposures (up to ten minutes) to 3% and considers concentrations exceeding 4% as "immediately dangerous to life and health." People who breathe 5% carbon dioxide for more than half an hour show signs of acute hypercapnia, while breathing 7%-10% carbon dioxide can produce unconsciousness in only a few minutes. 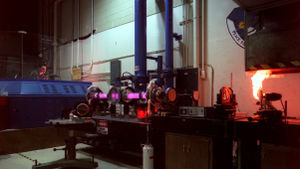 Carbon dioxide, either as a gas or as dry ice, should be handled only in well-ventilated areas. 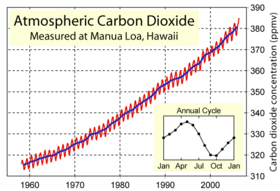 Concentrations of carbon dioxide in atmosphere. Despite its small concentration, CO2 is a very important component of Earth's atmosphere, because it absorbs Infrared radiation at wavelengths of 4.26 µm (asymmetric stretching vibrational mode) and 14.99 µm (bending vibrational mode) and enhances the greenhouse effect. The three vibrational modes of carbon dioxide: (a) symmetric, (b) asymmetric stretching; (c) bending. In (a), there is no change in dipole moment, thus interaction with photons is impossible, while in (b) and (c) there is optical activity. 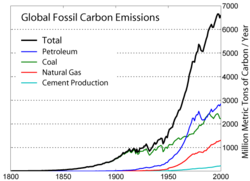 Global fossil carbon emissions 1800-2000. 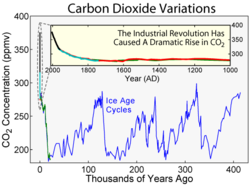 Variation of carbon dioxide in the past. Some studies have disputed the claim of stable CO2 levels during the present interglacial (the last 10 kyr). Based on an analysis of fossil leaves, Wagner et al. argued that CO2 levels during the period 7-10 kyr ago were significantly higher (~300 µL/L) and contained substantial variations that may be correlated to climate variations. Others have disputed such claims, suggesting they are more likely to reflect calibration problems than actual changes in CO2. Relevant to this dispute is the observation that Greenland ice cores often report higher and more variable CO2 values than similar measurements in Antarctica. However, the groups responsible for such measurements (e.g., Smith et al.) believe the variations in Greenland cores result from in situ decomposition of calcium carbonate dust found in the ice. When dust levels in Greenland cores are low, as they nearly always are in Antarctic cores, the researchers report good agreement between Antarctic and Greenland CO2 measurements. On longer timescales, various proxy measurements have been used to attempt to determine atmospheric carbon dioxide levels millions of years in the past. These include boron and carbon isotope ratios in certain types of marine sediments, and the number of stomata observed on fossil plant leaves. While these measurements give much less precise estimates of carbon dioxide concentration than ice cores, there is evidence for very high CO2 concentrations (>3,000 µL/L) between 600 and 400 Myr BP and between 200 and 150 Myr BP. On long timescales, atmospheric CO2 content is determined by the balance among geochemical processes including organic carbon burial in sediments, silicate rock weathering, and vulcanism. The net effect of slight imbalances in the carbon cycle over tens to hundreds of millions of years has been to reduce atmospheric CO2. The rates of these processes are extremely slow; hence they are of limited relevance to the atmospheric CO2 response to emissions over the next hundred years. In more recent times, atmospheric CO2 concentration continued to fall after about 60 Myr BP, and there is geochemical evidence that concentrations were <300 µL/L by about 20 Myr BP. Low CO2 concentrations may have been the stimulus that favored the evolution of C4 plants, which increased greatly in abundance between 7 and 5 Myr BP. 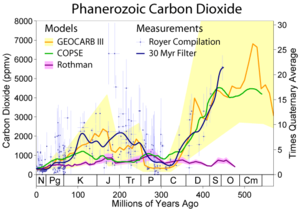 Although contemporary CO2 concentrations were exceeded during earlier geological epochs, present carbon dioxide levels are likely higher now than at any time during the past 20 million years and at the same time lower than at any time in history if we look at time scales longer than 50 million years. NOAA research estimates that 97% of atmospheric CO2 created each year is from natural sources and approximately 3% is from human activities. The RCRS on the space shuttle Orbiter uses a two-bed system that provides continuous removal of CO2 without expendable products. Regenerable systems allow a shuttle mission a longer stay in space without having to replenish its sorbent canisters. Older lithium hydroxide (LiOH)-based systems, which are non-regenerable, are being replaced by regenerable metal-oxide-based systems. A metal-oxide-based system primarily consists of a metal oxide sorbent canister and a regenerator assembly. This system works by removing carbon dioxide using a sorbent material and then regenerating the sorbent material. The metal-oxide sorbent is regenerated by pumping air heated to around 400 ºF at 7.5 scfm through its canister for 10 hours. Carbon dioxide in the oceans.